Which Stock Market Will Deliver Sustainable Profits? The Morningstar Sustainability Rating gives investors a way to evaluate portfolios based on the sustainability profile of their underlying holdings. In essence, it allows one to measure how well the holdings in a portfolio are managing their ESG risks and opportunities relative to a portfolio's Morningstar Category peers. The ratings for funds and exchange-traded portfolios are normally distributed into five groups, represented by one to five globes. These are assigned after sorting funds in each Morningstar Category by their respective Morningstar Portfolio Sustainability Scores. The scores are an asset-weighted roll-up of company ESG scores from Sustainalytics research, with deductions taken for involvement in ESG-related controversies. Sustainalytics has ESG scores on 4,500 companies and controversy scores on 10,000 companies. Morningstar normalises Sustainalytics’ company ESG scores to make them comparable across industry peer groups, a necessary step when scoring diversified portfolios. 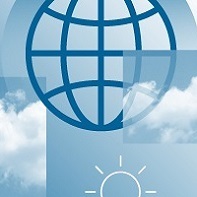 Industry peer groups have varying ESG score ranges and means, and, because the relevance of particular ESG issues varies across the peer groups, a unique combination of indicators is used within each peer group to determine the company-level ESG score. From a geographic standpoint, certain regions and countries tend to score higher than others. In this report, we review the Portfolio Sustainability Scores of all Morningstar Country Indexes. Although funds or ETFs that mimic indexes may have Sustainability Ratings, indexes themselves do not. We also provide a closer look at the drivers of each index's Portfolio Sustainability Score by analysing separately their two subcomponents, the Portfolio ESG Score and the Portfolio Controversy Score. In total, the 35 country indexes represent 98.6% of the Morningstar Global Markets Index, which had in September 2016 a total market value of $43 trillion. Since Sustainalytics' ESG and controversy coverage skews toward larger caps, a small percentage of the stocks included in the indexes are not covered. It is also worth noting that each country index targets the top 97% of stocks by market capitalization. Therefore, in aggregate, the Portfolio ESG Scores coverage is around $39 trillion, representing 91% of the assets under management of the Morningstar Global Markets Index. Portfolio Controversy Scores have a higher coverage, at 96.3%. Morningstar Portugal Index's Sustainability Score of 67.4 is the highest globally, with Denmark (65.8) and the Netherlands (60.9) close behind. While Portugal is a small and concentrated index – the top three holdings represent over two thirds of the index, which counts just 13 stocks with a total market cap of less than $28 billion as of September 2016, the basket is mostly composed of stocks with ESG scores that rank above average or high in their respective global industry peer group. All of the top 10 countries in this ranking are European. The highest-scoring non-European country is Australia, whose Morningstar Index ranks 14th out of the 35 equity benchmarks. The United States ranks in the second-lowest quintile. Emerging-markets countries tend to score lower; China receives the second-lowest score. The Morningstar Russia Index (38.5) scores the worst. The Morningstar South Africa Index has the best Morningstar Sustainability Score among emerging-markets countries. On a regional basis, the Eurozone indexes provide the best opportunities in terms of sustainable investments. Which Market Scores Highest on ESG Measures? ESG Scores represent the degree to which companies in a portfolio have transparent policies and management systems in place to address their ESG-related challenges. Denmark tops the global ranking with a Portfolio ESG score of 69. Portugal and the Netherlands are next. The top half is again dominated by European, and in particular Eurozone, countries. 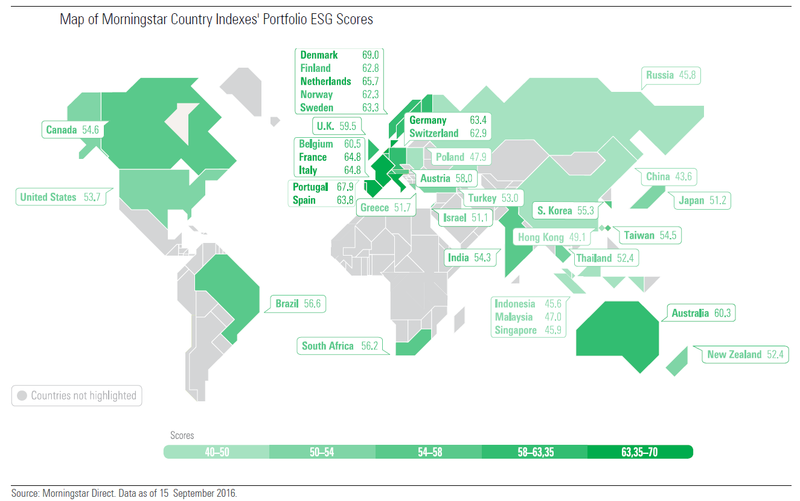 China receives the lowest Portfolio ESG score in this data set (43.5). Companies representing less than 1% of the China index's AUM have Above Average or High company ESG scores. Morningstar Singapore Index has the highest share of companies with Low ESG Scores (15%). Which Market is Most Hit by Controversy? Sustainalytics defines a controversy as any incident that has a negative environmental or societal impact and poses a material risk to the company involved. Companies with current involvement in ESG-related controversies are penalised in Morningstar’s methodology. Higher Portfolio Controversy Scores identify ESG-related risks. Sustainalytics assesses companies for their level of involvement in major controversies or incidents, which are categorised from 1 meaning low impact and risks, to 5 meaning severe impact and risks. The Morningstar Switzerland Index has the highest Portfolio Controversy Score (8.8), followed by Israel (8.6), and the United Kingdom (7.7). Russia and Germany also rank in the top quintile. 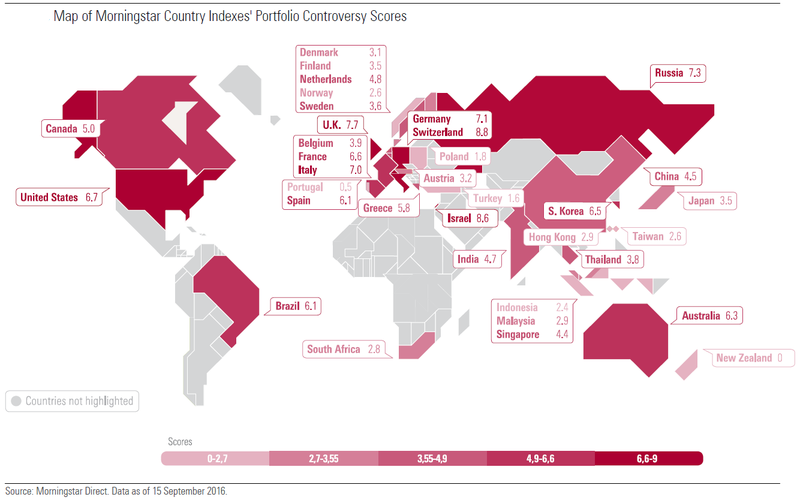 The Morningstar US Market Index Portfolio Controversy Score of 6.7 is also relatively high. Portugal's very low Portfolio Controversy Score (0.5) helps shed light on its remarkable Portfolio Sustainability Score. New Zealand's low score highlights the fact that virtually no company in this basket is involved in severe controversies. Interestingly, we find at the bottom of this ranking, with relatively low Portfolio Controversy Scores, several emerging-markets indexes, such as Turkey, Poland, Indonesia, and Taiwan. Which Sin Stocks Do UK Equity Funds Own?